Lily Poulter vividly remembers the last time her shoulder popped out of its socket. The nine-year-old was at school, engrossed in a test, when the slightest wrong movement caused the serious pain. It wasn’t the first time it happened without warning and it will not be the last. With her gap-toothed smile it would be easy to mistake Lily for a normal girl who adores learning and painting. Yet she relies on opiate based medications every day to stay on top of her chronic pain caused by Ehlers-Danos Syndrome- a disorder which causes her points to regularly pop out of place. She also suffers from Complex Regional Pain Syndrome, which overstimulates the nerves, making even the slightest touch painful. “The lowest pain I have is about a five and the highest is about a nine,” Lily said. 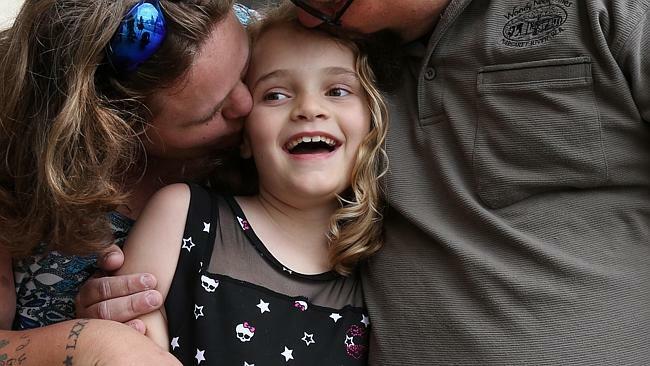 Lily’s parents, Nicole and Lyndon, are one of thousands of families across Australia who are fighting for the legalisation of medicinal cannabis. Mrs Poulter said she believed the natural form of pain relief would be a better substitute to the addictive and strong medications, including Tramadol and Oxynorm, Lily takes up to four times a day. “They are opiate based and we all know opiates are highly addictive so I’m dreading the day she actually has to come off it,” she said. WA Labor leader Mark McGowan has thrown his support behind the family’s plight to urge the state government to join medicinal cannabis trials taking place across Australia. “Last year I announced I supported the prescription of medicinal cannabis for people who are terminally ill or in chronic pain in Western Australia,” he said. New South Wales, Queensland and Victoria are scheduled to take part in the trials. WA Health Minister Kim Hames said there was no point in all states doing the same sorts of trials at the same time. “WA is waiting on the results of the NSW trials as agreed last year,” he said. Whatever the outcome Lily said she would continue to work hard in the classroom so she could become a doctor. “So I can help people like me,” she said.